Fireworks and Air Quality: It’s not all boom and gloom! July has past, and the fireworks were strong! While we have been on our air quality adventure in the Triboro EcoDistrict, some have asked what the impact of fireworks are on our air quality. Don’t worry! It’s not all boom and gloom, there are some fireworks options that are better for the air quality than others! Learn more from this blog written by New Sun Rising Air Quality Interns, Anaïs Peterson and Noah Robinson! One of the most iconic parts of Fourth of July celebrations are the fireworks. The US has been using firework displays to celebrate independence since the birth of our nation. But has anyone ever stopped to think about just what is in those fireworks? Fireworks are great to watch but the ingredients of fireworks aren’t so much fun. 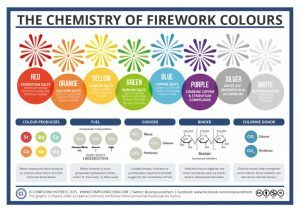 Fireworks are chemical reactions – that’s what makes the colors, noise, and what propels them into the air. Because fireworks are shot up into the air the chemicals that they are comprised off end up both in the air and raining back down into our soil and water. If you’ve ever watched a fireworks show and saw a large cloud of smoke after it ended then you’re familiar with what we’re talking about. A study conducted from 1999-2013 found that the average concentration of fine particulate matter over a 24 hour period of time was 42 times higher over the Fourth compared to the surrounding days. Fine particulate matter is concerning because the particles are 20 times smaller than the diameter of a human hair. In fact these particles are so small they can end up in your bloodstream. Of course correlation doesn’t equal causation but when fireworks were set off next to an air quality monitoring site in Utah, the PM concentrations rose 370%. People with asthma often feel the impact of these high PM concentrations first and it recommend that people who are affected by the smoke drink lots of water, watch from upwind of the fireworks, and keep inhalers close by. Each color of firework is comprised of a different combinations of metals. These metals create beautiful colors but they can also cause problems to our health. Blue- The blue color you see in fireworks is created using copper. On its own copper is not toxic but when combined with other compounds in fireworks dioxins are formed. Dioxins cause a number of adverse health effects and it is listed as a carcinogen by the World Health Organization. Red- Red fireworks are a result of strontium. Strontium is extremely reactive with air and water and can end up in the soil and groundwater after firework shows. At low levels strontium does not cause health problems but at high levels it can impair bone growth in children. White- White fireworks utilize aluminum which is one of the metals most used by humans. At low concentrations it’s safe but at higher levels it can impact mental and physical performance. Cadmium is also used in many different colors of fireworks. Cadmium is a known carcinogen and breathing in high levels of this metal can result in lung,stomach, and kidney damage. While this certain isn’t good news about fireworks this doesn’t mean the firework shows need to end! The United States military is working on developing green technology for explosives which can easily be applied to fireworks. Scientists are also working on technology which launches fireworks into the sky without any smoke.The color choices of firework displays also have an impact on the pollution! Next time before purchasing fireworks check the image below with information on what metals are in each color and how they might affect you. A number of cities are also changing from fireworks to light shows which are both better for your health and the air quality and also don’t scare your dog!